Four opportunities to image the Super Moon, four locations, and five lenses, they are all here... 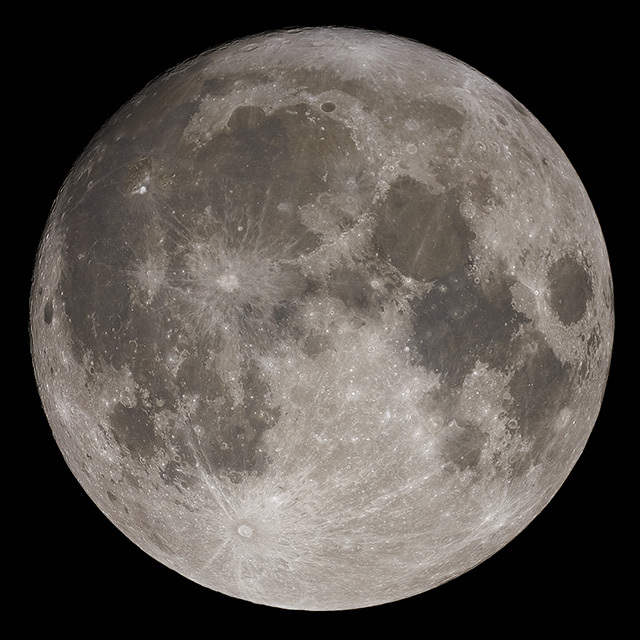 I took advantage of the Super Perigee Moon to use all of my astrophotography lenses to shoot the Super Moon, at different times and in different locations over the course of just over one day. The different shooting contexts gave me an opportunity to explore using lenses with focal lengths of 60, 135, 200, 400, and 1350 mm to image the Moon. 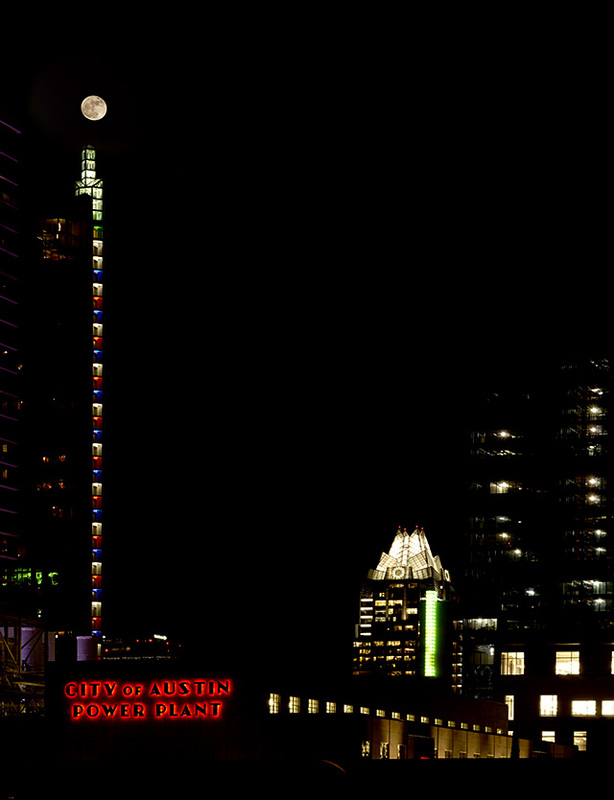 The fourth of my perigee super Moon image locations: Super Moon over the 360 Tower and Frost Building in downtown Austin. Taken from the Pfluger Pedestrian Bridge with a Sony a6300 camera and Sigma f 2.8 60 mm prime lens. Exposed 2016-11-15 01:44 UT at f8 and ISO 100. Buildings for 1 sec and Moon for 1/200 sec. HDR composition and perspective correction in Photoshop. 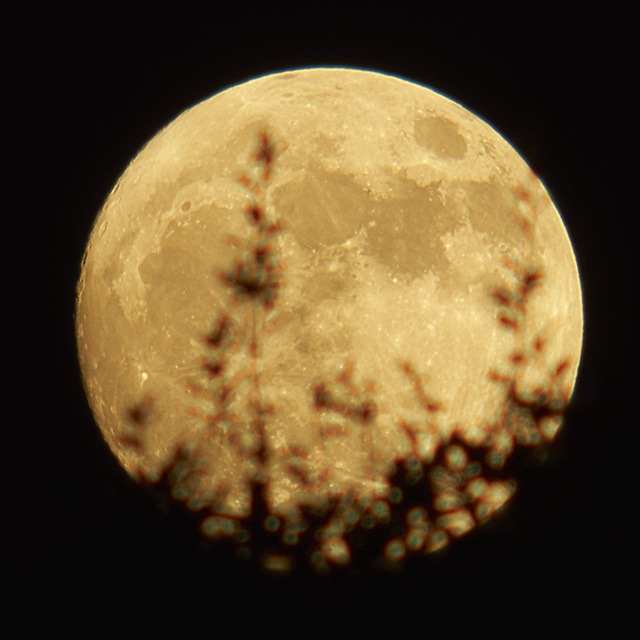 My third in a series of images of the Super Moon. The setting of the perigee Moon just an hour before full was spectacular. 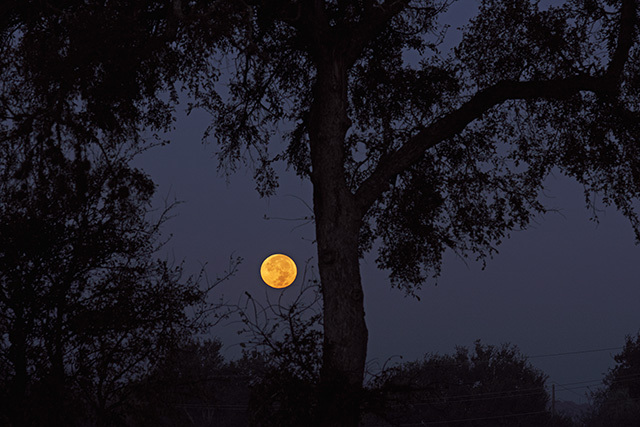 The appearance of the Moon changes from hour to hour. Different locals, lenses, and telescopes provide different opportunities for images. 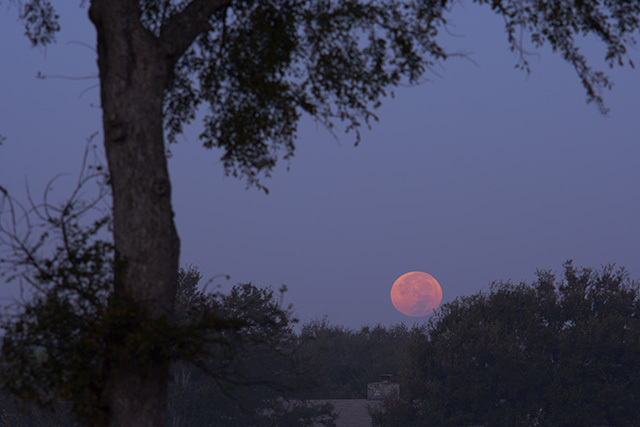 I've used a shorter lens to get more context and colors from the sky and trees with the setting Moon in this image. Image above taken Taken 2016-11-14 12:39 UT with a Sony a6300 with a vintage Vivitar 135 mm lens and exposed for 1/8 sec at ISO 100 and f8. Just a minor exposure adjustment in Photoshop to bring out the tree. I switched to the 200 mm lens right before the Moon disappeared below the horizon. Taken 2016-11-14 12:46 UT. Sony a6300 with vintage Vivitar 200 mm lens taken at f8 for 1/3 sec at ISO 100. This is my second image of the Super Moon, taken with the Moon high in the sky for the most detailed image with the telescope. The Alpine Valley is visible in the full size, 3752x3752, cropped image. The perigee Moon less than 9 hours before full at 2016-11-14 05:14 UT. Good seeing and average transparency. Questar 3.5" with Sony a6300 camera at prime focus. Best 8 of 93 images aligned and stacked with 8 parameter affine transforms in Nebulosity. Deconvolved in Lynkeos. Final crop and tweaks in Photoshop. Taken 2016-11-14 00:02 UT with a Sony a6300 and vintage Vivitar 200 mm prime lens with a 2X teleconverter. Exposed at f8 for 1/8 sec at ISO 100. Final crop and exposure in Photoshop.